Search Results for "school garden"
KANDY, SRI LANKA - FEBRUARY 2014: Local school girls in the botanical gardens in Kandy. The gardens attract 2 million visitors annually. 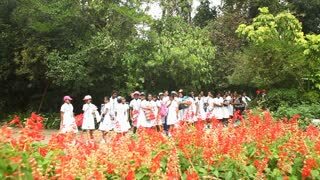 KANDY, SRI LANKA - FEBRUARY 2014: Tracking shot of local school girls in the botanical gardens in Kandy. The gardens attract 2 million visitors annually. KANDY, SRI LANKA - FEBRUARY 2014: School girls posing with little caucasian girl in the botanical gardens. The gardens attract 2 million visitors annually. Little kids tell each other secrets in their ears were talking in circles. Fun games in the school garden. Small children sit on the chairs. Quietly say to each other. Whisper in ear. Three little girls happy drumming his hands on the color box and laughing. Drum kit for little princesses. Cute, little girl playing in the school garden. Knocking on the colored boxes, smile, play. Students Talking in the Courtyard Garden of a Rural School in Argentina. Full HD. 1950s: School library. Home economics class. Students stand near garden in schoolyard. Teenage boy works in woodshop. Students walk along sidewalk. 1960s: UNITED STATES: Christmas tree on fire in garden. Girl smiles at camera. Children at school.